Datum is a blockchain-based data management company that aims to help us control our personal data. Here’s our Datum review. Datum found online at Datum.network, is a blockchain-based marketplace and data management system that aims to turn data into a secure, tradeable commodity. As the Datum website explains, “data is the new oil”. Datum has created an exchange for that commodity powered by Ethereum, BigchainDB, and IPFS. The Datum pre-sale is taking place throughout August, with an ICO scheduled to begin on September 12. The project is being developed by a team in Switzerland, Singapore, and Hong Kong. Datum works by providing a decentralized and distributed high-performance NoSQL database based on a blockchain ledger. The technology will allow anyone to backup structured data (say, social network data or data collected from wearable devices) in a secure, private, and anonymous way. 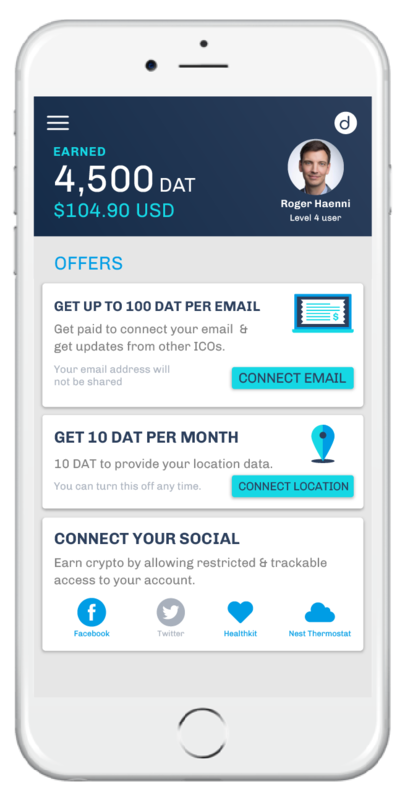 Then, Datum provides a marketplace where users can share or sell data on their own terms. Today, personal data management is a bit of a mess. We use social networks for “free” by selling them our data. They sell this data to advertisers, and the social networks earn an enormous amount of money. We have little control or knowledge over where our data ends up, or how it’s being used. Datum aims to use the blockchain to put us back in control of our data. You can choose to sell your data to trusted organizations – or, you can choose to hold onto your data long-term. Datum provides secure, private, and anonymous storage of structured data. Miners running storage nodes are paid for storing and providing low latency access to data. Datum’s marketplace allows users to share their data selectively or sell their data to trusted entities. The Datum ecosystem revolves around DAT tokens. data owners pay small amounts of tokens to store their data. Storage miners earn DAT tokens to store and transmit data. And buyers can purchase DAT tokens to buy user data. Datum will have a mobile app that promises to be simple to use. All data in the app will be encrypted before it’s sent to the network. Data is cleaned from personally-identifying information and patterns. And app users enjoy fast backups and data retrievals through locally close storage nodes. As an example of how the app works, Datum shows an image of the front page of the app, featuring icons for Facebook, Twitter, Healthkit, and Nest Thermostat. You can view your “earnings” from sharing data through each platform. You can also enable or disable data sharing with a simple toggle. Step 1) User submits data: Data is encrypted with specific usage terms attached. Step 2) Storage node miners save data, and storage nodes earn DAT tokens in exchange for providing that storage space. Step 3) Buyers acquire data under terms. The buyer will purchase DAT tokens. Then, a smart contract will initiate off-chain key exchange to release data. DAT tokens are transferred to the owner of the data, and the buyer uses that data according to the terms. The concept for Datum began in September 2016, with the whitepaper and concept validation launching in June 2017. The pre-sale is taking place throughout August, and the token sale is taking place between September and October 2017. The company is led by CEO and Co-Founder Roger Haenni, who also co-founded StockX, SwissInvest, PCP.ch, and Kosi. Other key members of the team include Gebhard Scherrer (Operations, Co-Founder), and VC Tran (Marketing, Co-Founder). Altogether, the team has over 80 years of experience building large scale data processing and management systems. The company is based in Switzerland, Singapore, and Hong Kong. Datum’s token sales are taking place throughout August, with the ICO scheduled for September/October. The company aims to change the way we manage and control our data. It puts users back in control of their data, letting users choose which data they wish to share, and with which parties. Users can profit off selling their wearable fitness tracker data, for example, while preventing companies from viewing their social media information on Facebook. Datum has the potential to change the way we manage personal data. Find out more about the company today by visiting Datum.network.